A short description of the party's unwholesome elven spear woman, Drusilla. May contain tantalizing hints about the nature of the North and elven mores. I will be producing these character sheets and bios as I complete portrait's for my players, which they have been clamoring for. Lemon should be next. As always feel free to use the adventurers as NPCs, or even pre-gens in your own ASE games. They have absurdly high statistics as somehow my players seem to have gotten absurdly lucky the day they rolled up characters. I should also note that the 'fluff' below, and the world building it represents comes directly from play as the characters have been fleshed out over the past four months. The all started as simple stat block, but now have emergent histories and personalities (mostly nasty - though I've managed to post the two most sinister of the PC's). Alignment: Chaotic –Drusilla is fairly lawful within her own predatory elven ways. 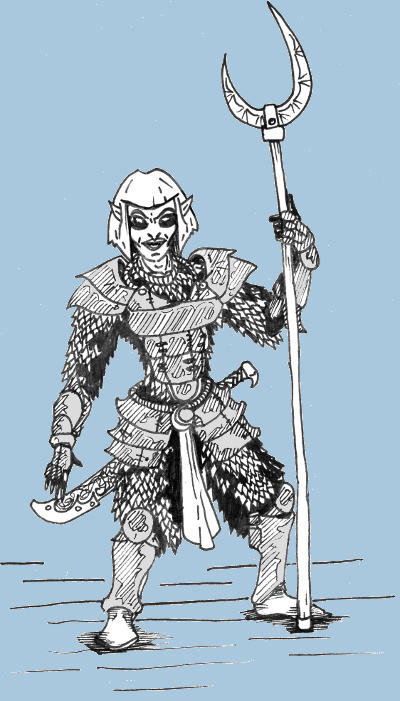 She doesn't delight in rule breaking, like many outcast elves, and would never go against what the war counselors or commandants of her tribe "The society of the Raider's Moon" commanded, but she has little understanding of human laws. Spells: Drusilla's small anthropodermic spell book contains the following spells written in the practiced hand of an elven elder: Sleep, magic Missile, Feather Fall, Dancing Lights. Drusilla has added these additional spells since arriving in human lands: Floating Disc, Read Magic, Detect Magic, Detect Good, Darkness, Phantasmal Force and Monster Summoning II. Drusilla was an up-and-coming elven raider amongst the wild elven tribes far North of the Eater of Cities. Enjoys melee far more than the practice of magic, but recognizes her own relative frailty, preferring to fight from the second rank using her pole-arm's reach. The use of the military fork, bardiches and heavier armor is common among Northern elves, so Drusilla's fighting style is the norm for her people. In pitched battles Northern elves will often open their stock pens and use a front line of armored monstrous sub-humans (ogres) herded by elves with pole arms and backed by crossbow armed marksmen. Drusilla has only skirmishing experience however, and does not fully appreciate the horrors of mass combat. She is a bit incautious when exploring as well, but is wise and selfish enough to avoid most dangerous activities. Drusilla is rather physically attractive for an elf, but her personality is brash, profane, and off-putting to most. It may be simply that she has not renounced her human eating ways, despite spending considerable time amongst humans, and so tends to look at them as if they are a fancy meat animal that has suddenly learned to talk. She was quite popular back in her tribe's home bunker complex, and is having trouble adjusting to being viewed as a psychotic creep while living and working with humans. It's unclear exactly why Drusilla hasn't started a trek back North to her people but it's likely that the free life of an adventurer appeals to her far more than the hierarchical barracks life of the Northern Elf Societies. There are also hints that she's staying away from an arranged marriage, possibly with an elf from a rival fighting Society. Even for an adventurer, she is especially fond of wealth and can be hired, if the pay is decent and the risk seems small. Her ultimate goals are unclear, though she has hinted at megalomaniacal schemes.